Although Tasmania has only one species of Gymnoschoenus, this species (G. sphaerocephalus) is so abundant that one of Tasmania's main vegetation types is colloquially named after it (Button Grass). 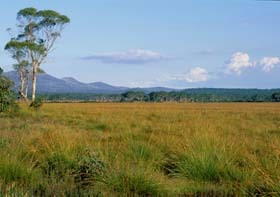 This species is the dominant species of most lowland sedgelands on wet peat in Tasmania. 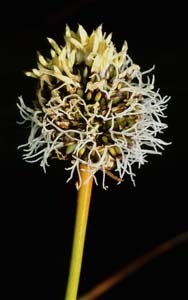 It forms large, dense clumps of long, narrow, yellow-brown leaves with numerous long, cylindrical stems, each bearing a spherical head of flowers and fruit (typically about 15mm wide) at the end (apart from a short subtending bract).